The coastal lifestyle is all about being outdoors. While going to the beach is always an option, enjoying the ocean breeze in your backyard is an everyday opportunity. Design your own coastal paradise in your front or backyard. The association of palm trees and coastal areas is no accident - many species grown right up to the seashore in their natural habitats. They bend gracefully when high winds barrel in from the ocean and don't mind the salt-laden spray that makes most plants cringe. Allee is a French landscape design term to describe two long, parallel rows of single specimen on either side a path, road or driveway. 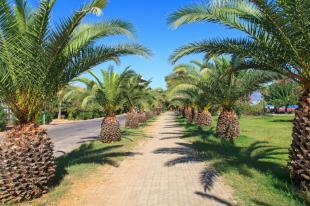 In coastal areas, palms are a great choice for this approach, giving a regal feel to any entryway. Use medium-sized palms, like the Washington fan palm or heart of palm. Tall, skinny palms scattered through the grounds of a coastal property create a gentle breezy feel as they bob in the breeze. These can be placed throughout lawn areas and flower beds - anywhere that there are no other large trees. Use the tallest species, like coconut palms and royal palms. 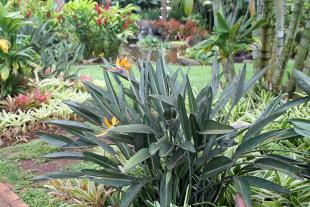 Smaller palms are useful as focal point, much like a small flowering tree would be used. Place them in the center of a flower bed, out in the middle of the lawn, in a corner of the yard or framing the mailbox. The species with top-notch ornamental qualities when viewed from close up are the best choices, such as pindo palm, foxtail palm, bottle palm or the tiny palmetto palm. Large ornamental grasses have the same leisurely swaying as a tall palm tree, but they do it at ground level. There are two main approaches depending on the size of the grass. Coastal dunes are typically colonized by native grasses, but the effect can be achieved with any large scale planting of medium-size clump-forming grass species. You can form a series of long, low meandering mounds with any type of soil to mimic the look of sand dunes or choose to plant them on existing flat terrain. Sea oats are the classic choice, but you can also consider other varieties that have long airy seed stalks such as pennisetum or deer grass. 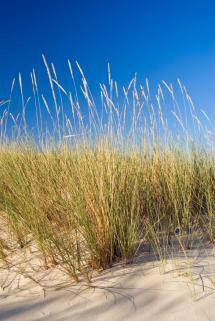 Taller grass species are useful for creating informal hedgerows in coastal gardens. Pampas grass is commonly used for this purpose, as it is native to coastal bluffs and has tall stiff seed stalks that stand like sentinels in the wind. This species grows eight to 10 feet tall making it suitable as a privacy screen. Slightly smaller species, such as feather reed grass or pink muhly grass, can be used as waist high borders at the back of flower beds. Alongside palms and bunchgrasses, low spreading oaks dripping with Spanish moss are the other quintessential image of the coastal landscape. To truly fit the bill, these should be live oaks, meaning an evergreen variety. There is a version for both the East and West Coasts - Quercus agrifolia in the West and Quercus virginana in the East. Coastal oaks typically grow wide and low to the ground, making them an ideal shade structure to escape the glaring coastal sun. The shade of a live oak is a natural place to plan picnic and play areas in a coastal garden. 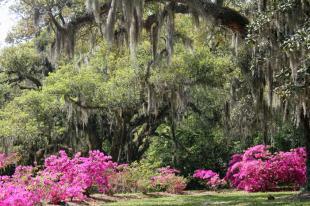 Shade-loving plants are another option for using the space under live oaks. 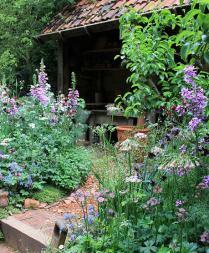 There are a few species that enjoy both shade and sandy soil, making them particularly appropriate. Try sabal palm, flame azalea and tea camellia for a classic East Coast shade garden. On the West Coast, flowering currant, barberry and California coffee berry are better choices. Live oaks are not very cold hardy and don't fit the aesthetic of the colder windswept coastlines of the country. In these area, consider conifers instead, many of which take on iconic gnarled forms when subject to coastal storms for years on end. Monterrey cypress is a classic West Coast specimen for this purpose, while the blue atlas cedar is an East Coast equivalent. Certain flowering plants excel at creating the kaleidoscopic color display that gives a tropical flair to coastal landscapes - even those that are far from tropical latitudes. 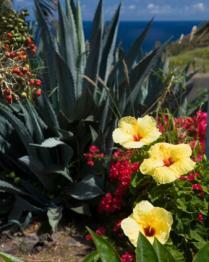 These shrubs and small trees make a great focal point to put a tropical exclamation point on a coastal landscape. Most are not very cold hardy, but can still be planted in a large container and brought indoors in colder climates. Of course, not all coastal areas lend themselves to the exotic tropical aesthetic. On the chilly New England coastline, for example, traditional cottage gardens are more likely to be found. In these areas, the muted tones of light blue, pale yellow, white and cream rule the flower bed. Hollyhock, foxglove, delphinium are all likely candidates, as well as Rosa rugosa, a species of rose known for its tolerance of seaside conditions. A barbecue pit, sun shade and lounge chairs are three items no coastal garden should be without. 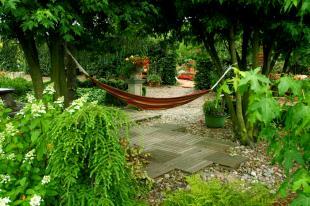 Adding a hanging swing or hammock is a cherry on top that will elevate the landscape from functional space to a coastal paradise. Finally, don't forget the citronella candles for the patio! 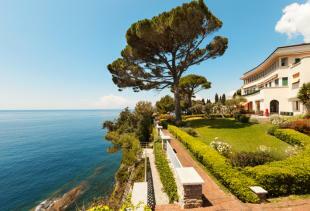 Coastal gardens are a different animal than the typical home landscape. Salty air, high winds and sandy soil necessitate a specialized plant palette, but even more importantly, matching the feel of the coastal environment with an appropriate landscape design brings that magical quality to your door, even if you don't live right on the water.